Microsoft has released the Windows 10 Insider Preview Redstone 4 (RS4) build 17133 to Insiders on the Fast ring. The Windows 10 Build 17133 is believed to be the final RTM build for Windows 10 Spring Creators Update (SCU) version 1803, which was signed off on 23rd March 2018. 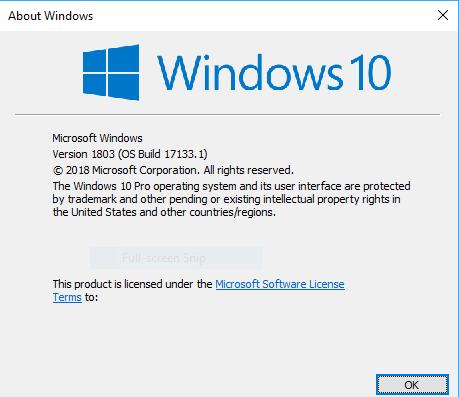 This final build of Windows 10 Spring Creators Update v.1803 will be the build that is sent to system builders and of which future security and cumulative updates are based on during its support lifetime, even though Microsoft does not use the term “released to manufacturing” (RTM) to describe the milestone anymore due to switch to Windows-as-a-Service (WaaS) model. Fixed an issue resulting in certain devices with BitLocker enabled unexpectedly booting into BitLocker recovery in recent flights. Fixed an issue resulting in not being able to change the display resolution when there were 4 or more monitors connected, due to the confirmation prompt hanging when you selected “Keep changes”. Fixed an issue where clicking suggested search terms when typing in the Microsoft Edge URL bar didn’t do anything. The Windows 10 Build 17133 has the full build string of 10.0.17133.1 and ISO / UUP file name starting with 17133.1.180323-1312.RS4_RELEASE_CLIENTPRO_OEMRET. Even though it’s from rs4_release branch, do note that Windows 10 Build 17133.1 may not be the final RTM build, as Microsoft is still in the phase of checking in final code to prepare for the final release. In addition, several Insiders have reported sightings and bugs that shouldn’t appear in a RTM build. Thus, Microsoft may release ZDP (Zero Day Patch) or CU (Cumulative Update) if show-stopper bugs are found that may bring up the final RTM build version for Windows 10 v.1803, just like Windows 10 Fall Creators Update v.1709 has the build number 16299.15. The update to Windows 10 Spring Creators Update v.1803 should be much faster as Microsoft has revamped the upgrade process. If you’re Windows Insider, you can go to Settings -> Update & security -> Windows Update to download and install the Windows 10 Build 17133.1 automatically. If this build is a RTM build, it should be pushed to Release Preview and Slow rings soon. Windows 10 Spring Creators Update is expected to release to public on April 10th, 2018, a Patch Tuesday day, though it will roll out in phases to larger pool of users gradually. When available in Windows Update, it will be listed as “Feature update for Windows 10, version 1803”. Update 6: Due to BSOD bug, Windows 10 Build 17133 has been demoted from RTM status. Instead Microsoft released Windows 10 Redstone 4 Spring Creators Update Build 17134 as potential RTM candidate. Update 5: Cumulative Update KB4100375 updates Windows 10 v.1803 to build 17133.73. Update 4: Windows 10 Build 17133.1 is flighting to Release Preview ring on 5th April 2018, confirming it as the RTM version of Windows 10 Spring Creators Update (SCU). Update 1: Windows 10 Build 17133.1.rs4_release.180323-1312 is released to the Slow ring on late March.